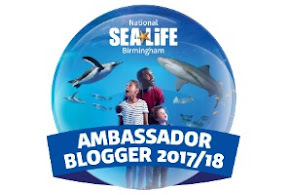 On a dreary weekend, it's tempting to stay at home and hibernate but I like to have at least one thing to do or a place to go and there's lots in the Midlands to do that doesn't involve being out in the rain - such as the National Sea Life Centre Birmingham. We have been a few times with little man and he was excited all week for our latest visit. We set it as a treat for Ethan for doing well in his potty training (eight days straight of being dry, and he managed to have no accidents while we were out too - yay!) and he was a very happy chappy when we arrived. Yesterday, we went to National Sea Life Centre Birmingham for their special Snail and the Whale event that's run all half term. It's another Julia Donaldson classic and you can pick up parts of the story as you go around the centre. I've shared more snaps over on my main Instagram page, using the new multi image posting, if you'd like to see more highlights from our latest visit. If you're a Great British Bake Off fan and live in the Midlands, then you won't want to miss a special evening with Mary Berry when she comes to Birmingham Town Hall on Thursday 16th March 2017. 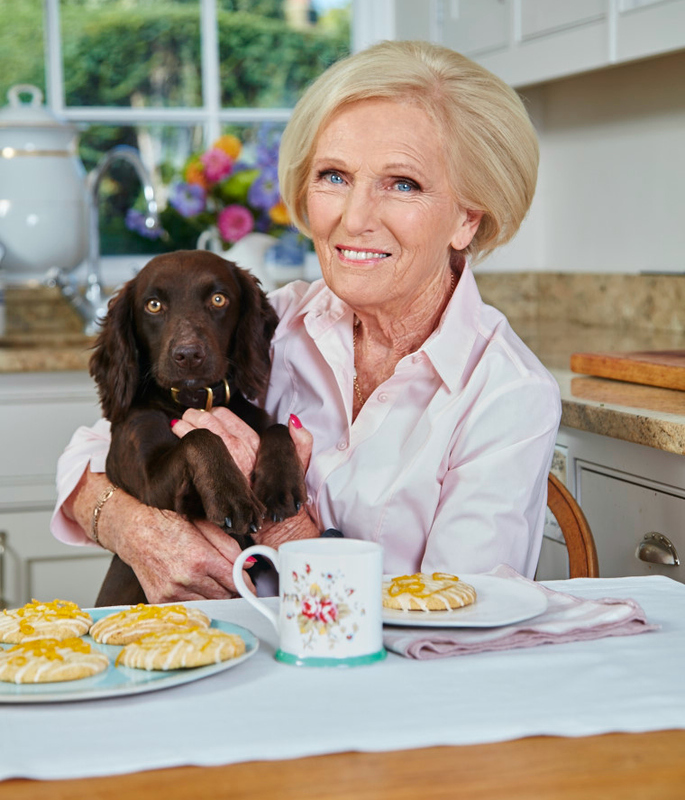 Ahead of her tour to talk about her new book - Mary Berry Everyday – Make every meal special, published by BBC Books, 26th January 2017 - I've been given a special interview with the culinary queen herself to share with you, as part of my ambassador role for THSH. Win a bundle of party supplies for your next celebration! 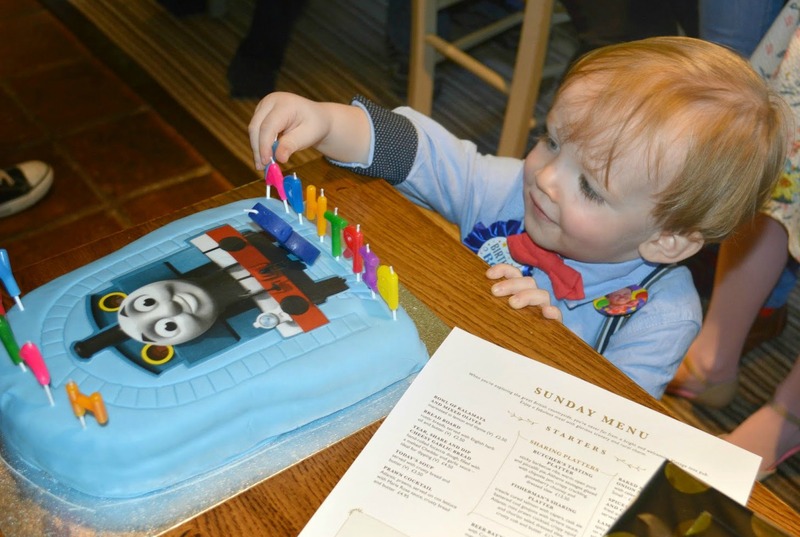 I love a good party and with a little boy about to turn four in May, it's another excuse to get into party planning mode and start thinking about themes, party supplies and activities. We had a teddy bear's picnic for his first birthday and he vividly remembers the dinosaur cake from last year, so I want to do something again this year as it's something he really remembers and I really enjoy putting a celebration together. I remember when we first brought Ethan home from hospital; carrying him like he was made of eggshells, scared that we would drop him or that he's scratch himself with his nails if we didn't have a baby mitt ready for him to wear at all times. I think he actually did scratch himself before we even got home, and then we started to see all the potential hazards here and there... how have we been living in this death trap for so long?? How will we keep our baby safe?! It quickly became an obsession for us, baby-proofing. Particularly when he started crawling, he could cover so much ground in seconds and would always find something to pick up and put in his mouth that he wasn't supposed to. It's amazing as a skill how quickly you start noticing potential problems, be it items that can get spilled or things that might be sharp or hard. Even though Ethan is nearly four and we have all the key bases covered, it's still really easy for something to happen and for him to hurt himself. 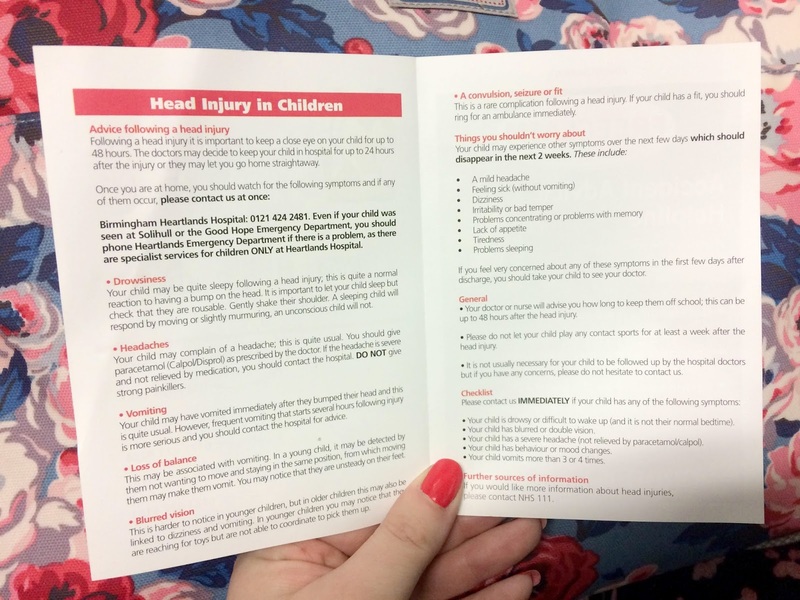 They can't be wrapped in cotton wool and accidents do happen - as we learnt a couple of weeks' ago with our trip to A&E with suspected concussion following a very short tumble down the stairs. Apparently, according to research, half a million children under the age of four, like Ethan, are sadly hurt in the home every year - sometimes, just a small bump, but other times, it's something more serious. It's mostly common sense but a really good refresher and I actually got one question wrong (at what temperature does scalding occur) so I learnt something from this. Spring is (hopefully) just around the corner and I know I'm not alone when I say I can't wait. I'm getting impatient now with the cold days and grey skies and with the slightly lighter evenings starting to creep through, I really am hoping that the new season doesn't take too long to arrive. With Half Term on the horizon, many families will be looking for places to go and things to do. It's always nice visiting somewhere new or making a day out of a trip to the shops, which is just what we did the other weekend. 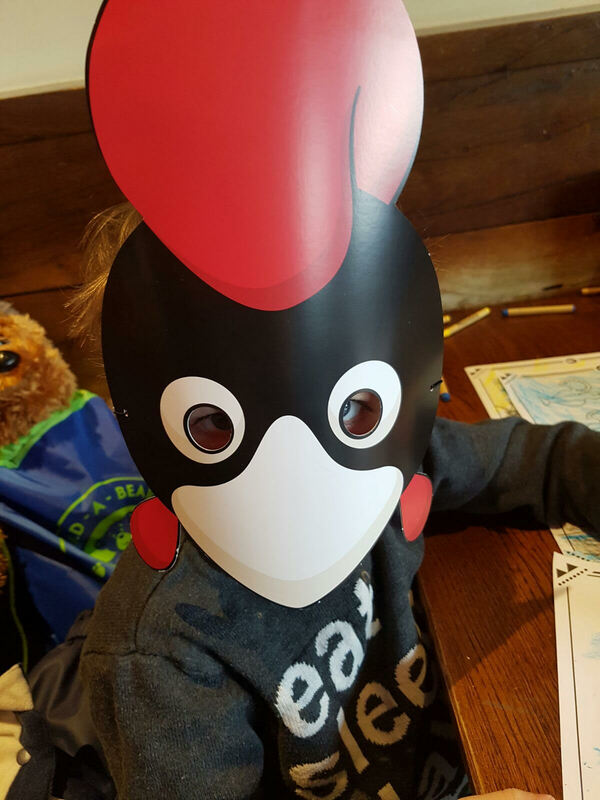 We haven't been to intu Merry Hill many times, with our last visit being to see their Santa grotto, but we went along to try out the children's menu at Nando's. 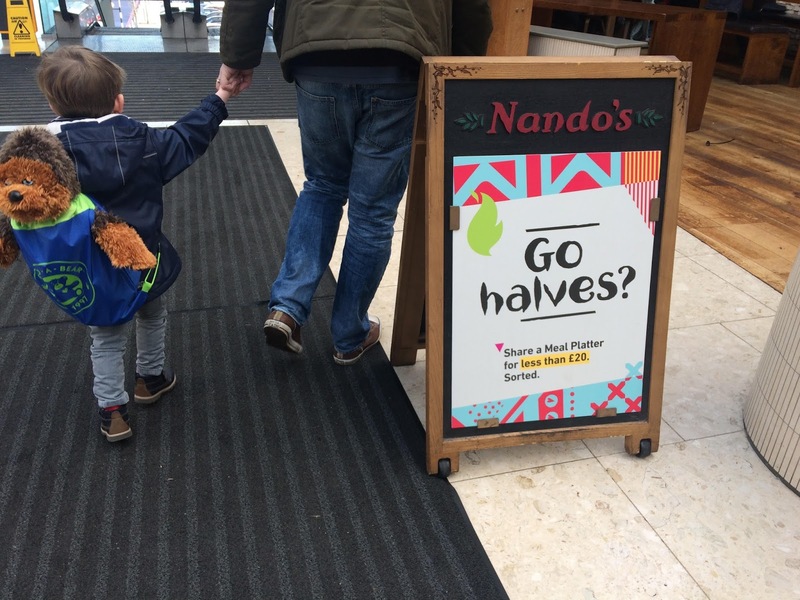 We're Nando's fans in our house, and I often cook with some of the sauces and spices at home. I mean, what's not to love? 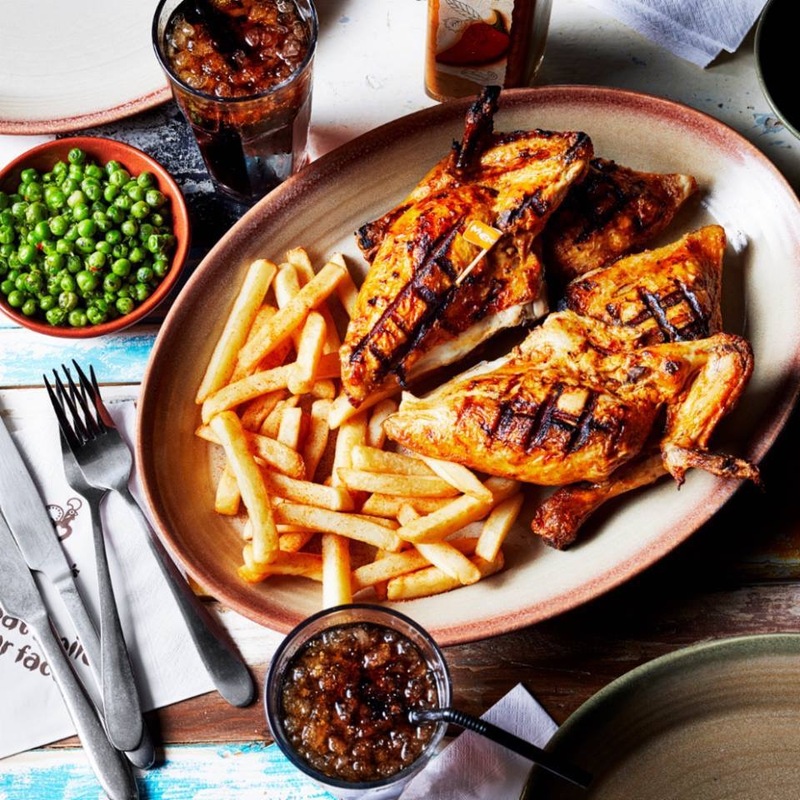 Roast chicken, tasty peri-peri flavours to suit your taste then add a tasty side - corn on the cob, rice, mash, fries, macho peas... mmm, my mouth is watering just thinking about it! 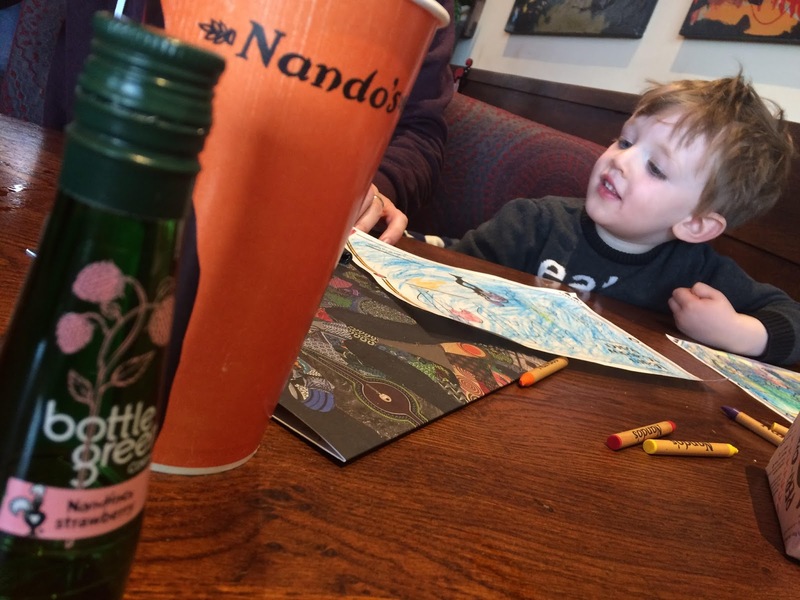 I wasn't sure if it would appeal to our bambino, but upon arriving to a warm welcome by the manager, Adam, and seeing both the colouring pages and crayons laid out and the Nandino's menu, I had a good feeling. 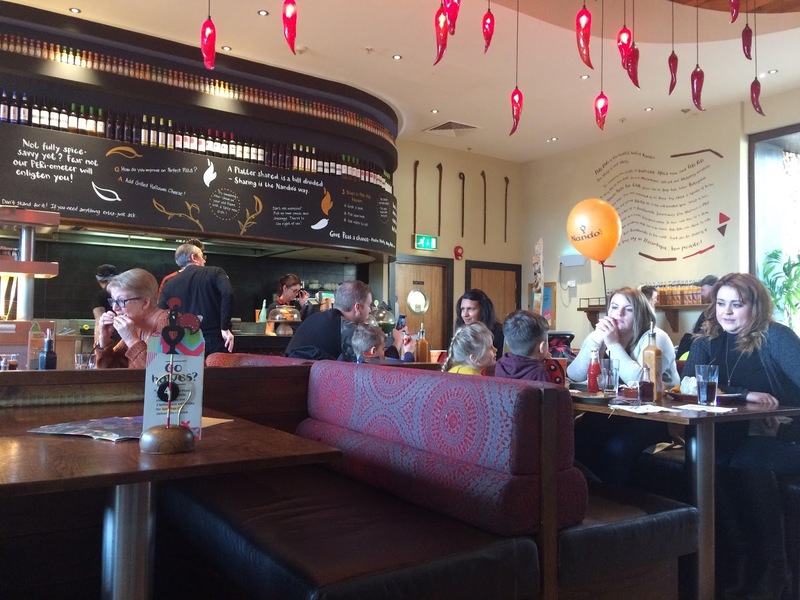 Nando's intu Merry Hill is quite different to others we have been to, and it had a bright, colourful and well laid out tables. 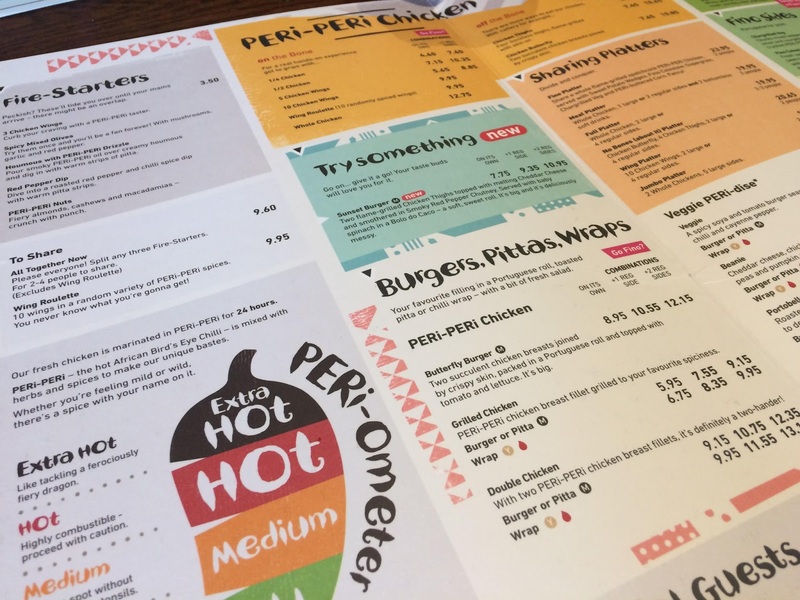 It's just as bustling and popular as Nando's always seems to be and looking through the menu, despite chicken being the core theme (naturally), there was still a lot to take in. New sweet potato wedges. 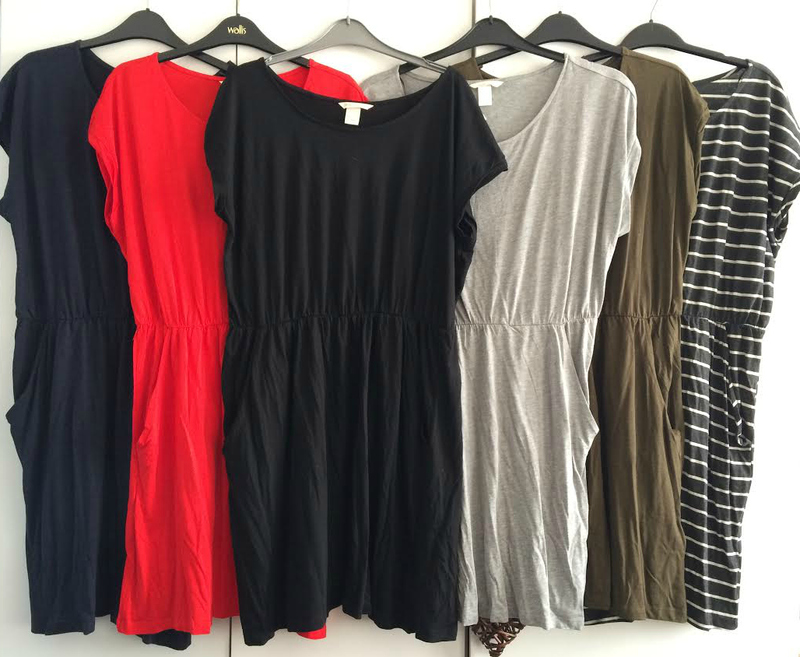 Primo side options. Chicken thighs. Superfood salads. The Nandino's menu has plenty of options to piece together so you can create a plate to suit your toddler / little person. You can choose a sauce too - mild, and there's a sweet barbecue option - and there's veggies to enjoy and frozen yoghurt and ice pops to finish everything off. It's great value too - Ethan's meal beat even his insatiable appetite. He opted for chicken, chips and a bowl of tomatoes - which obviously appealed the most as he polished these off first - and he enjoyed tucking into it all for himself. "I like chicken and tomatoes and chips - AND sauce! I ate all my tomatoes first and then the chicken strips. Mmm!" "Look at my pictures - they're marvellous! I like colouring." Hubs went for a sunrise chicken thigh burger, which I had been tempted by, with a side of macho peas, but instead I opted for one of the salads. I've never had one at Nando's before, and had trouble picking one, but was so glad that I did. Mine was full of avocado (not just a couple of small cubes), grains and flavour and I opted for chicken thighs to accompany it, with mango and lime sauce. Hubs and I then split some sweet potato wedges that went just perfectly with my salad - and made for a really filling lunch. 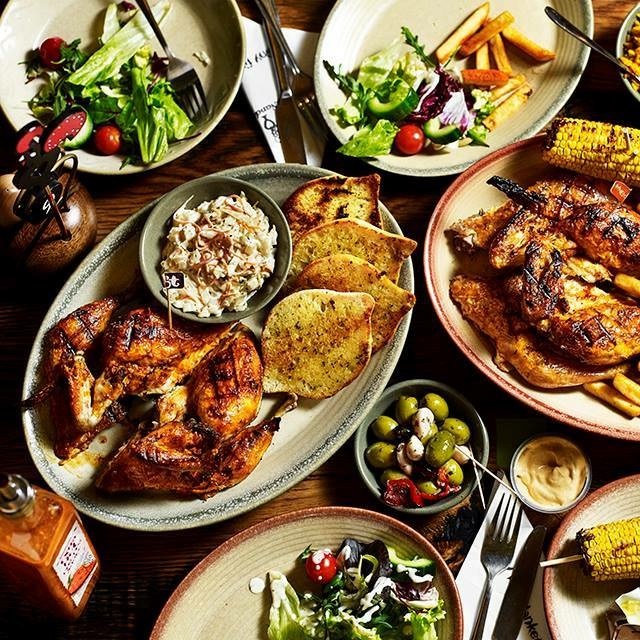 "We like coming to Nando's as we like their style of cooking and choosing different sides to suit what we fancy." "I tried something different this time - a super grain salad - which I've never usually gone for but it was super tasty and the chicken thighs were a delicious addition." 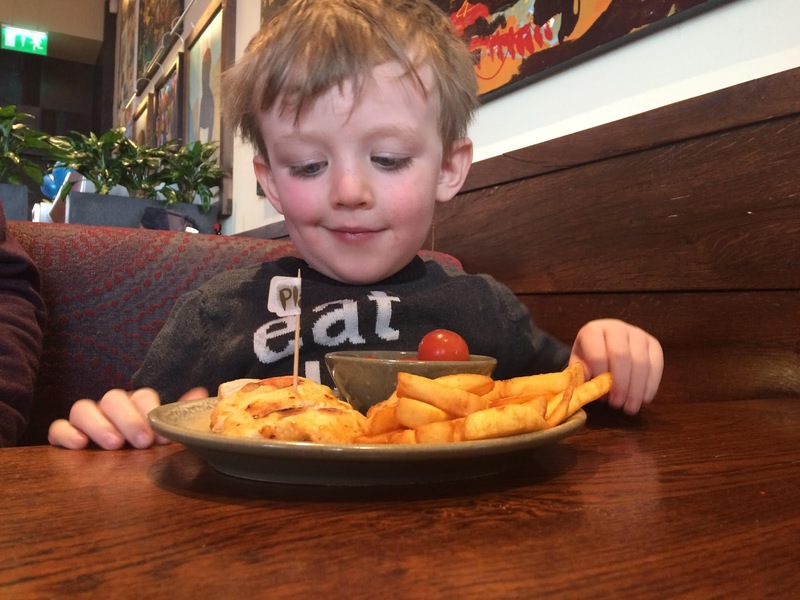 "Try the sweet potato wedges too for something different - they're good for you and little ones like them too!" 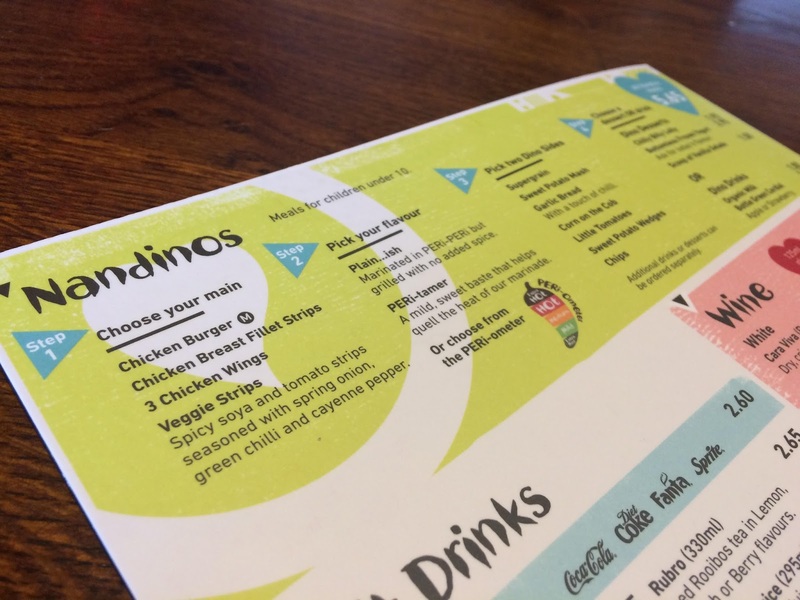 "The Nandinos menu is great as you can mix and match options to suit the taste (and mood) of your toddler, and there's plenty of veggies too. You can also choose plain or mild sauce for the chicken for delicate tastebuds, plus a frozen yoghurt or ice pop as a less sugary treat afterwards." Our complete meal, including Ethan's mean, drink and dessert deal and two refillable soft drinks for us, came to just under £34, which was actually a surprise and just the right kind of budget for a family like us, out for the day. The hospitality at the restaurant, despite how obviously busy it was, and their open approach to families and children was great and the food I, or Ethan, could not fault. * We were invited to enjoy a complimentary meal in return for an honest review - and that's just what we have done. Also, look out for Ethan's critique in the intu Merry Hill Half Term leaflet! I am a firm believer that you can never have too many cushions. Just as well, as we have quite a big collection in our house! A chair, a sofa or a bed just isn't complete without a cushion and I love how you can get them in all shapes and sizes. Big, soft ones to snuggle up against, firmer scatter cushions to tie together a look or accent cushions that make a statement or are simply there to look good. I'll never forget how a BBC comedy series, Coupling, perfectly encapsulated how men and women often see cushions differently, with the main male character, Steve, going into a monologue about 'what is the point of cushions? ', when you more often than not move them out of the way before you sit down. It was a really funny thing and it does seem that cushions are something that us ladies seem to really get carried away with. Before Christmas, we ordered a new sofa. I never liked our previous one - something we ordered just as we needed it before Ethan was born, and it arrived on the morning I was in labour - and having redecorated our lounge with a grey and yellow palette last May, it was about time we had a smart sofa to match. I absolutely love it, it fits in well and has room for all three of us - but it didn't come with any cushions. Not wanting to miss out on the opportunity to get some more, when the nice people at Sofa Sofa asked if I'd like to pick a pair of scatter cushions, I quickly snapped up the offer and had fun browsing the different options available. For me, all sofas need some solid, staple scatter cushions that match the style / fabric / colour and are going to be hardwearing - as long as the life of the sofa itself. I chose the Agatha scatter cushions, in Flanders Charcoal as possibly to closest colour match to our brushed grey sofa. I wanted something that would blend in well and when they arrived, I was really pleased with the match. The saying goes, 'age ain't nothing but a number', and the more I think about it, this can easily apply to being a parent too. Throw in the pregnancy books, magazines and blogs you read and you're head will be swimming with ideas and numbers and trying to make sense of it all. As your child grows, the obsession with numbers continues. How many days, weeks and months old they are. How much they weigh, how long or tall they are. How much milk they drink, how long until you start weaning, how many veggies they're getting. Do you watch how much TV or iPad time they have? What time do you put them to bed? How long to they sleep for, and how many times do they wake up? And what time do they wake up? Every stage and every decision seems to come down to numbers. 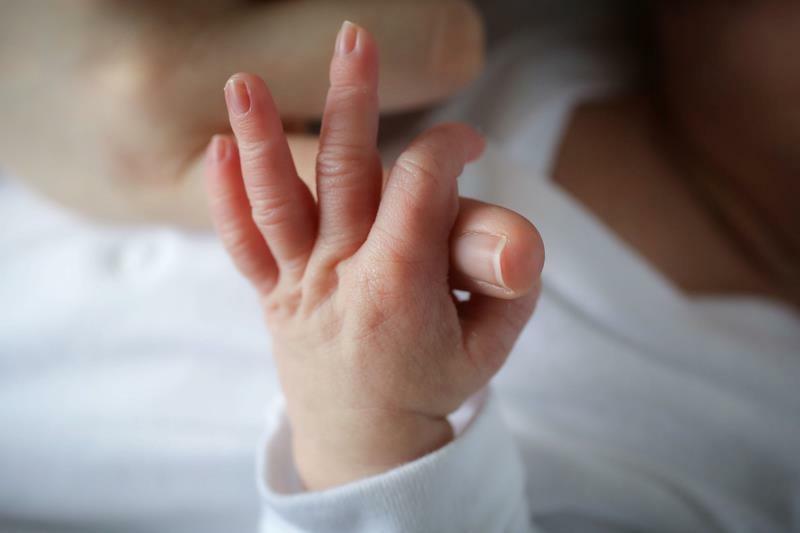 How long will you have off for maternity leave? How many months' in are you, and how many do you have left? How many baby classes do you go to? How old will your child be when you take them to nursery? How many days will they be there for? How many hours each day? As parents, we're quite complicit in the number counting. We learn during pregnancy that our life now comes down to numbers - dates, times, measurements - and this continues. It's almost like a parenting obsession. How many, how much, how long. We all make remarks about the passing of time, as if it's a surprise. It shouldn't be a surprise , we've been counting and tracking since the beginning! Parenting starts as counting down - to birth, to the end of maternity leave, to starting school but it's also a game of adding up. Milestones, experiences, memories. I think our obsession with numbers can actually make us miss the moment; always looking ahead to the next thing on our list, on the 'ABC' of raising a child. If we are always counting - be it down to a date or up to a milestone - we could actually be missing the moments that count. I've always said that the journey to become mum is one that never ends and if we took a little time to look around and take it in, rather than worrying if we are going to make a destination on time, or if someone else might get their faster than us, we might enjoy the journey all the more. Since my last review, when I added the new Eye and Cheek palettes to my daily make up routine, I have been back again because even more fab new products to add to the range... and this time, it's about shining bright like a diamond. The big announcement, under the theme of Glitter Underground, is the metallic liquid eyeshadows. Yes, that's right - liquid eyeshadow, that applies easily, blends well and sets quickly. And oh my, the shades, and sparkle, is quite something. I got a new camera this past week - the Sony A5000 - and I've been having a play with it and trying out all the settings. So far, so good and I am really enjoying experimenting and having fun with photography. When I have used it for a bit longer, I will probably share a post on here about it as I know myself that it's hard to choose a new camera and views from other people really help in cutting through the tech speak and understanding whether it would work for you and what you need. I managed to capture a moment between Ethan and Watson, our dog. 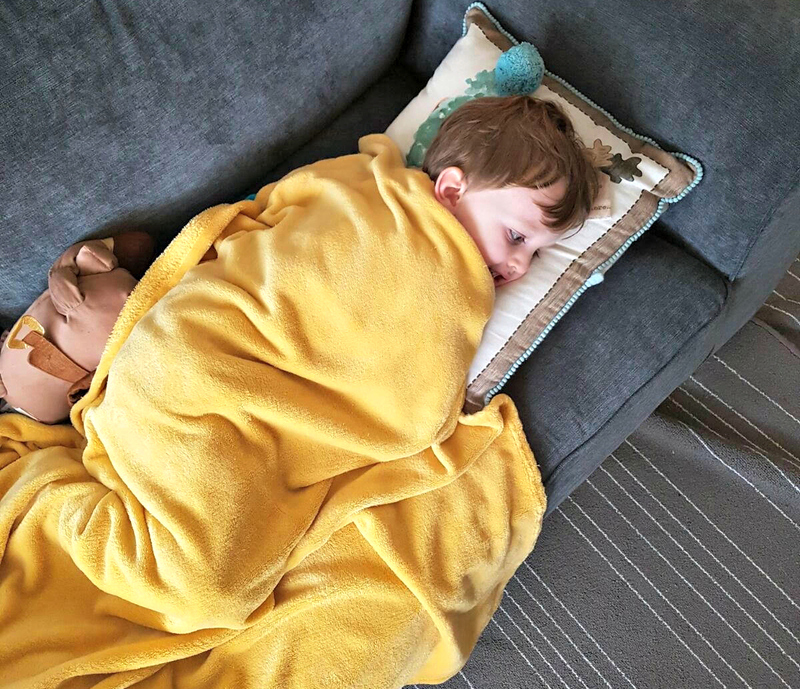 Ethan loves his four legged friend and recently has been very affectionate to him, giving him cuddles before we leave the house each day and cuddling him, saying he's his best friend. These photos are really sweet and seem to capture the feeling between these two friends. 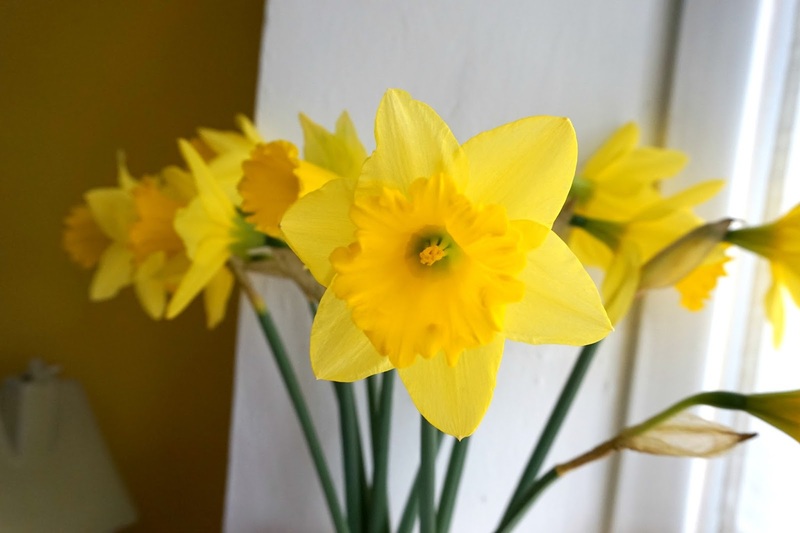 I don't know about you but I am really eager for Spring and hoping that the slightly lighter evenings and the arrival of daffodils in the shops means it's not too far away now. I feel that winter, Christmas aside, can be quite a dreary time of year and it often means staying warm indoors and not going out and about all that much. Exploring the great outdoors or our very own great outdoors - our garden - is usually something we wait until Spring to do. But thanks to Nomow, Europe's leading manufacturer of artificial grass that mimics the look and feel of the real thing, you don't have to put off your outdoor adventures, at home or away, as they have a 12 month National Trust family membership to giveaway to one lucky winner. Toddlers are tricksy, and accident prone, if our toddler is anything to go by. He often has bumps or scrapes at preschool and gets over them as quickly as they happen, and he's recently been developing his stealth skills, tiptoeing out of rooms when he thinks we're not watching to go and sneak a snack from the kitchen. And of course, we are watching. Most of the time. They always say that having kids means you need to have eyes in the back of our head, and it's true - they can go from safe and sound to in imminent danger in next to no time. I'm generally quite a relaxed mum. It's something I'm becoming more aware of as time goes on, particularly as hubs is much firmer than I am in comparison. Every parent parents differently and quite often the type of parent you think you will be isn't necessarily the same as the one you become. I think whilst hubs and I often take different approaches, which can cause some disagreement, we probably balance each other out and I'd like to think we can find compromises and negotiate a middle ground so there's no good cop / bad cop scenarios for Ethan to take advantage of. When at home, Ethan mostly has 'free-play' time and can choose what he wants to play with and use the space as he wishes. We're always around to keep an eye on him and to join in when he wants us to, and find that this works well for all of us; Ethan is independent but will also play happily with us and others, and we feel we have enough space to do what we need or want to, knowing that at least one of us is within eye or earshot. But of course, things don't always work that way. Whether you watch your children like a hawk or not, they can and will do something that hurts them / causes mess / makes you want to tear your hair out now and again. And Tuesday night, it happened to us. I popped upstairs to get dressed for yoga. Ste was in the dining room on the laptop. Ethan was in the lounge, right next door (and no doors in between the two rooms), playing with a pop up castle book he had just received as a gift. He'd been to the potty a couple of times like a good boy and knowing that he might earn a sticker in return, so when he went into the hall (where the potty is at the moment, to stop him from going upstairs alone), neither of us thought anything of it. Me: "I'm just going upstairs to get changed, I'll be two minutes, Bubs." Ethan: "I'll come and help you Mummy..."
Ethan had started to climb the stairs but slipped after only a couple of steps and fell backwards onto the laminate flooring, hitting the back of his head. Hubs had seen it happen and rushed to pick him up and we gave him lots of cuddles and tried to console him. But there wasn't any consoling him at all, and he was clearly in pain. Although it was almost bedtime so it could have been tiredness, his eyes started rolling and we wanted to be on the safe side so bundled him up in the car and headed to the hospital. We waited for three hours in A&E. During this time, there were four other boys in ahead of us, two also with expected concussions. Ethan was crying on and off the whole time and had really got himself worked up, but we managed, after some Calpol, to get him off to sleep (the nurse said it was fine, as long as you can stir them awake again). There was only one nurse on and Ethan was seen at 11.30pm, with checks made to his head, his breathing, his temperature and his eyes. The doctor said that the fact he was able to sleep and wake up was a good sign, as was the lack of sickness and how responsive he was; it seemed that his head was the main source of pain and he had got distressed by the situation. We were of course relieved. Hubs was so worried, about how Ethan was and also about how we might look like careless parents, but in the waiting room, it was clear that these things happen - however careful you are. 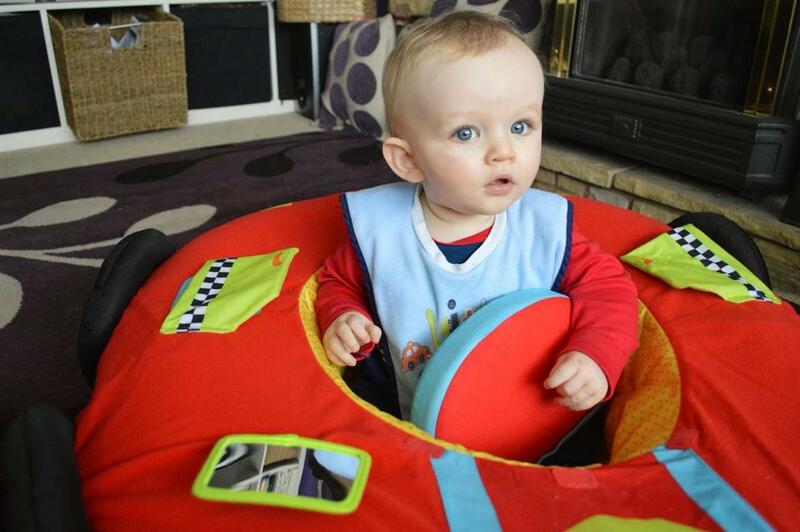 Ethan stayed at home with Daddy yesterday and was fine, eating and playing as normal and sleeping well. 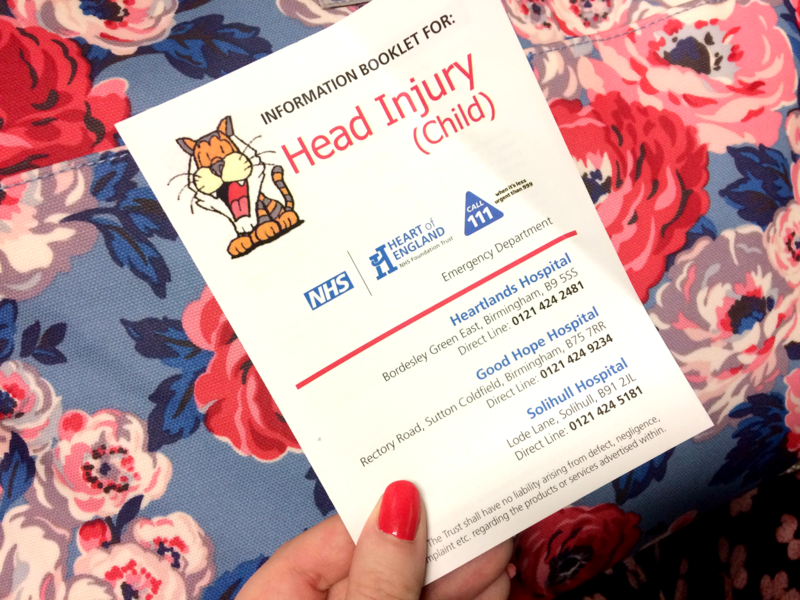 * Following a head injury, keep a close eye on your child for up to 48 hours. * You can expect any of the following symptoms, and need to monitor them: drowsiness, headaches, vomiting, loss of balance, blurred vision. * If any of the above are severe, or your child cannot be woken up or has a seizure or fit, contact the hospital immediately. * Administer Calpol if needed after the incident, as this will often ease the initial pain and don't worry if they want to go to sleep - just make sure they can be roused. I'm not a medical professional and this is simply the advice we were given and that was handed to us in a leaflet. If it was a bad bump, always seek professional advice and they will be able to assess their condition and advise if any further observations need to be carried out. It's so easy to panic in these situations, but it's also easy to be confused as to what to do; I didn't know if it was something to really be concerned about or not, so the best thing to do is play it safe and ask for a medical opinion. Ethan is fine now but knows what happened and knows he needs to stay away from the stairs unless we are there. He's been fine going up and down them for a long while now, often on his bottom, and hasn't had an incident before but as the other night showed, it only takes one slip for something to go wrong. So always play it safe. I really do like cooking and whilst Jamie won't be calling me any time soon asking me to fill in for him, I can make a decent dinner. My imagination when it comes to cooking, however, can take a bit of a hit sometimes and recently, I've become pretty lazy in the kitchen and just go week to week, or sometimes day to day, without much planning or thought when it comes to what I eat. I'm blaming the dark nights and being tired from working during the week for falling into a cooking rut but I know with a little effort and some pre-planning, I can up my chef game once more. 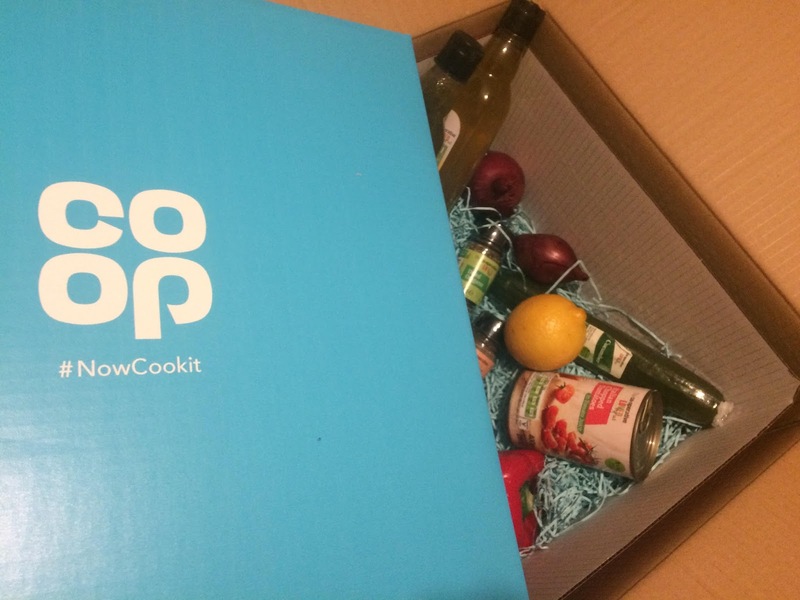 So when Co-op and SORTEDfood contacted me about a free online cooking course they were launching, I had every reason to start my better habits sooner rather than later. #NowCookIt is a new website that's just launched and includes a range of recipes and covers various techniques to help you cook most things. 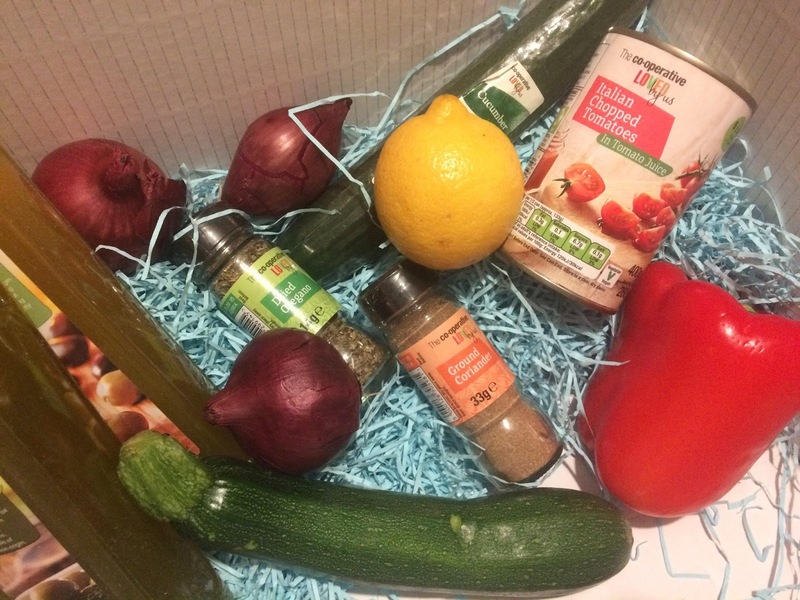 I was sent ingredients to cook a meal featured on the site and was excited to give things a go. Like I say, I do enjoy preparing food and will try out new recipes and give things a go - I just need the motivation. 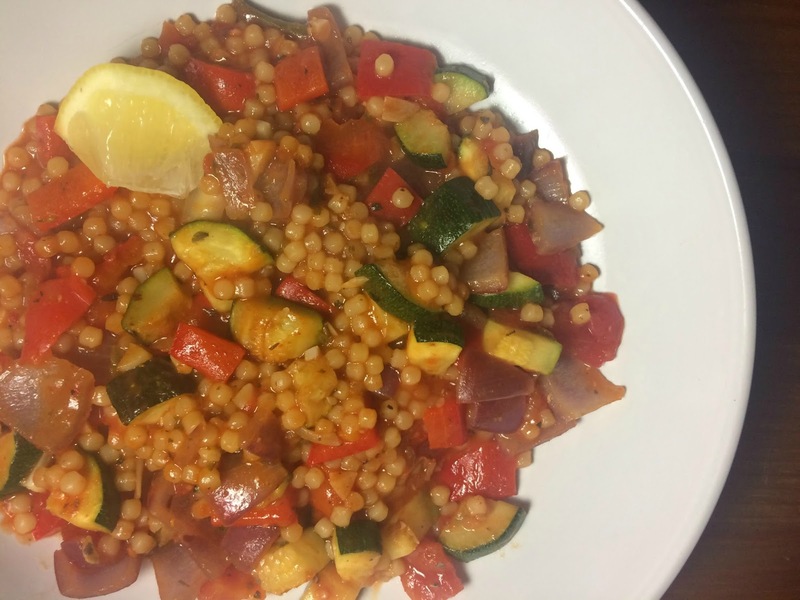 The recipe I made was roasted vegetable cous cous - something that fits with the kind of meals I would make during the week - and with all the ingredients out and ready, I found the corresponding video online easy to follow. The presenters of the recipe videos are energetic and fun to watch and the instructions are clear, too. I found it easy to follow what they were saying and to cook alongside them and it was actually a nice way to prepare a meal, as opposed to squinting at a torn out magazine recipe or scrolling on a phone with messy fingers, trying to follow instructions found on a website. 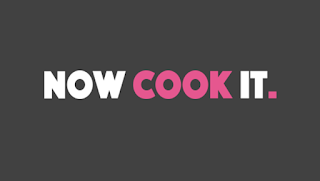 There's a good selection of recipes up on the website already and what's different about nowcookit.co.uk is the fact you can learn basic skills, complete recipes and earn status points and even rewards the more you cook. 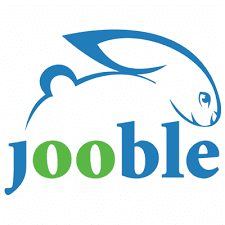 You sign in with Google, Facebook or Twitter (no fiddly online profile set ups necessary) and can share your progress as you go, with marks against techniques, recipes and 'know how' the more you cook. For me, that makes it more than a recipe site and helps provide some inspiration, and support, as I try and cook more myself, from scratch, at home. The recipe guide is fab too - watch the video or follow the instructions and pictures, and click on the tabs to find out how to do certain things, such as knife techniques or how best to cook cous cous. And you can print the recipe if you're old school. 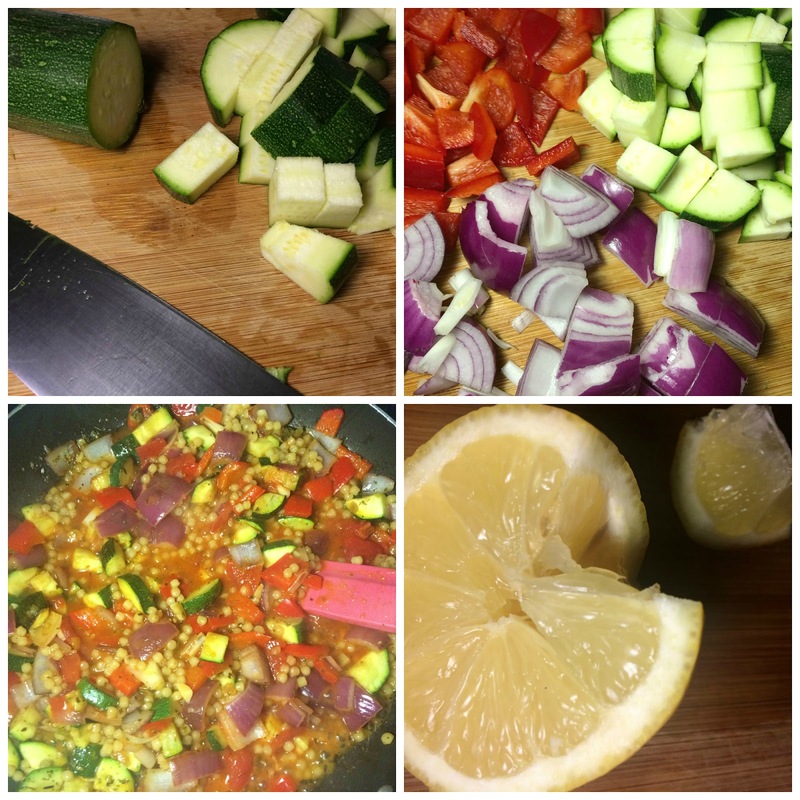 The cous cous recipe was delicious and so easy to make. I often make my own tweaks here and there, depending on what ingredients I have to hand or to suit the tastes of my family, but having a clear recipe to follow is always a good starting point. 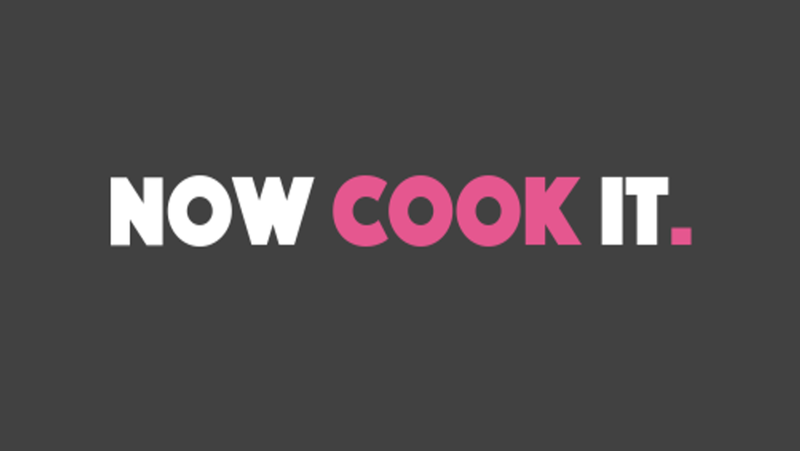 You can find out more about #NowCookIt here or visit the website to see the current recipe range and video tutorials. 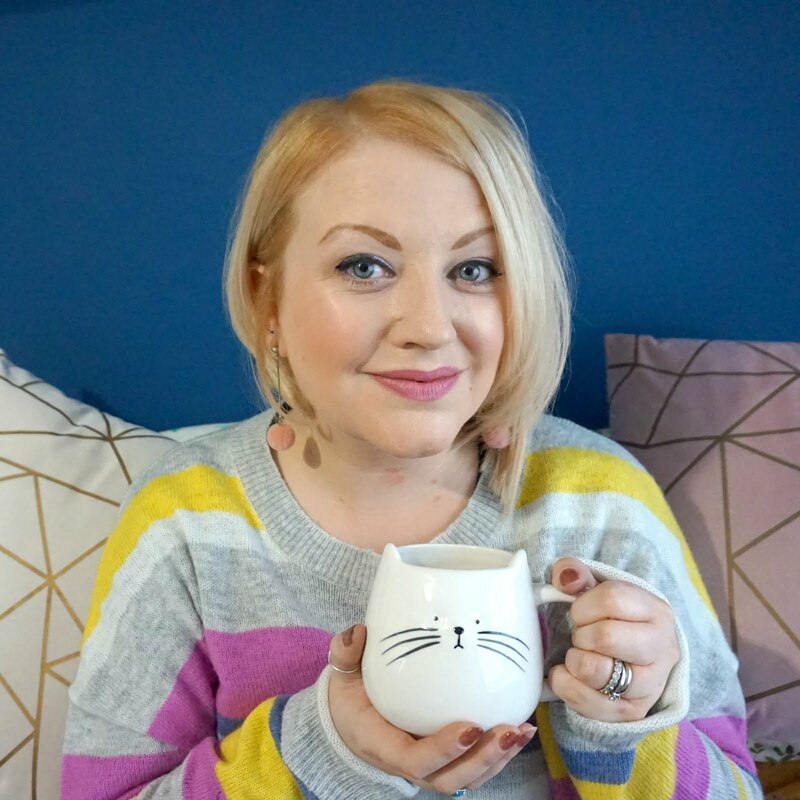 It's a fresh idea, presented in a fun and fresh way that makes it so accessible, and I'm keen to carry on with the online course to see how I get on and to build my skillset - and my 'must make meals' list. * I was sent ingredients to make a recipe but all opinions are my own.